Many different species of termites are indigenous to Arizona, but two certain species seem to cause the most damage. These are the Desert Subterranean termite and the Western Drywood termite. Here’s a little more information about them. Most commonly found in homes is the Desert Subterranean termite. One of their colonies can house over 300,000 insects. Many of these termites are reproductive termites that leave the colony to create a new one. It is not uncommon for several colonies to exist within the same area and on the same property. 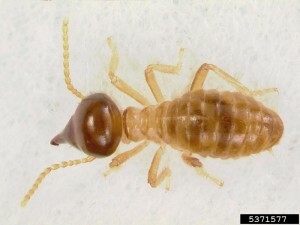 Desert Subterranean termites feed on timber and cause tens of thousands of dollars worth of damage when left untreated. A professional will most likely apply a combination of baits and/or liquid treatments to protect your home. Western Drywood termites are indigenous to the southwest. The colonies of this species contain only about 2,000 termites per nest. But because this type of termite develops new colonies often it can cause serious damage. These termites live in the timber of a home. They do not require a lot of moisture to survive. Treatment of these termites usually require a specialized treatment of the infested wood. Baiting is also a good option to control these termites. Regardless of what type of termite species you are dealing with, you should call on a professional for help. They will help you determine exactly what type of termite is in your home and the best way to treat it.